I'm kind of embarrassed to say where I got this recipe from.... okay well you know how some mystery novels have recipes? Yeah. There. Apparently when ones reading about donuts you start to crave it. I guess I could have just gone out to a shop and bought one to settle the craving for them right then and there but when I see a recipe for fast easy donuts? I'm all for it. In a bowl mix the yeast, sugar and water. Let sit for five minutes for the yeast to activate. Add the egg, butter, cinnamon, nutmeg, vanilla and salt and mix well. Slowly add in the flour until it's not sticky to the touch. Knead the dough for a couple of minutes. Roll out the dough to about 1/4 to 1/2 inch thick and cut out donut shapes and lay them on a baking sheet to raise for 30 minutes. Fry in canola oil at 360 F turing once so both sides cook evenly. Drain on a paper towel. Since these donuts are the light and airy sort I added a strawberry glaze to mine which consisted of icing sugar, vanilla, warm water and strawberry flavor. Once the donuts cooled I dipped the tops in the the glaze and added my choice of topping. Sprinkles, coconut or even crushed up nuts would be great! Oh, I am so, so tempted to try these but papa has gots to get some weight off! Oy! Still, as ever seduced by the beauty that is your blog, Ash! They look so delicious, and I LOVE how giant they are. Good choice on the strawberry glaze, and the toppings just complete the perfection. I think its pretty cool you tried out a recipe from a mystery book. They look nothing short of amazing. I love the pictures, the donuts, everything! SO BEAUTIFUL! I love the coconut topping, and also your post on how to make it! A mystery book, with recipes? Why don't I read these treasures?! These are on my to bake list this weekend. I love how lovely they look!! your photos are amazing by the way, i love the color schemes and depth of field. keep up the good work!!!! These are absolutely gorgeous donuts! The colours look so beautiful! Just discovered your gorgeous blog and am loving it! These donuts sound amazing. Can't wait to dig in deeper. 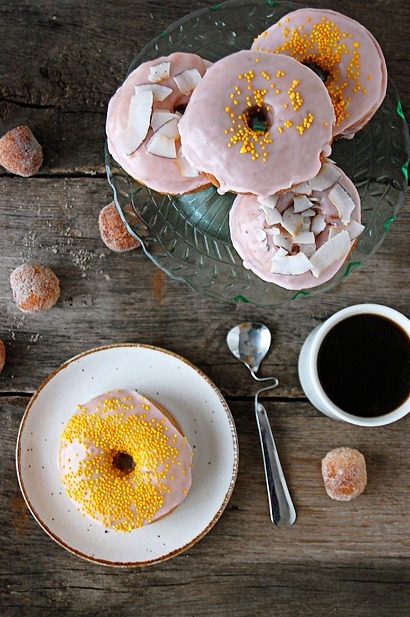 Gorgeous photos and delicious doughnuts! These sound absolutely incredible. I bet the strawberry glaze puts them over the top! I have had a donut recipe that I have been wanting to try for about 6 years and I still don't dare try them. I wish you could make them for me, because yours look perfect. Hey daaaaahling, long time no see! I'm loving these simply beautiful donuts! Please send one my way! Beautiful photos! I always thought donuts were too complicated to make for some reason. I will have to give this recipe a try, they look too good! The look gorgeous...pink plump perfection :) Love how you got the recipe from a mystery novel! look like the perfect weekend treat! did you pan fry them in canola oil or deep fry them? THanks everyone!! THese were such fun to photograph! Jesse: I deep fried them in about 3-4 inches of canola oil. I am ok to break my new year's resolution if I do it when eating something as good as this! hahahaha, i've been so tempted before to try out recipes from mystery novels... like joanna fluke's. sigh. anyway, well done! these look so tasty that i think i have to make a trip to the baker's tomorrow... given my lack of large-enough fryware... :) sweet post. these donuts are amazing. i am going to make them soon. WOW. beautiful looking donuts. i never new mystery novels have recipes for donuts. pretty cool. love your blog. I would indulge with a cup of coffee! Ohh, I must try this. Thanks for posting the recipe...your photographs are gorgeous! The bent spoon in your last photo is fantastic! Whats it called? Who makes? Where can I get one? And thanks for the donut post! Can't wait to try this recipe! Thanks for sharing. P.S. I always wondered where novels got their recipes. Jen: I can't actually remember where I got that spoon, I keep seeing a country type general store in my head, but I could be wrong. The spoon is actually made to rest freely on the edge of a mug with out putting it down, cool right? Sadly I haven't seen one since. Hi! I just discovered your blog and immediately decided to make these doughnuts. Your photos are enchanting and I hadn't had a doughnut in years, so I had to do it! Wow. So simple and delicious! I shared the recipe on my blog, with a link to your blog, along some pictures I took. Yum! Thank you for sharing this. Lovely lovely photos! So grateful to run across your lovely blog today! Keep shooting! Just found your blog, beautiful pictures! Thanks for always including recipes! 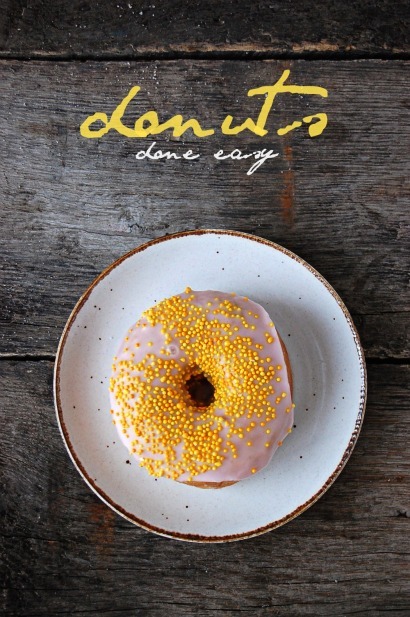 Beautiful photos and blog, so excited to include in my donut top 5. I'll be looking forward to your tweets on new recipes! Thank you!!! 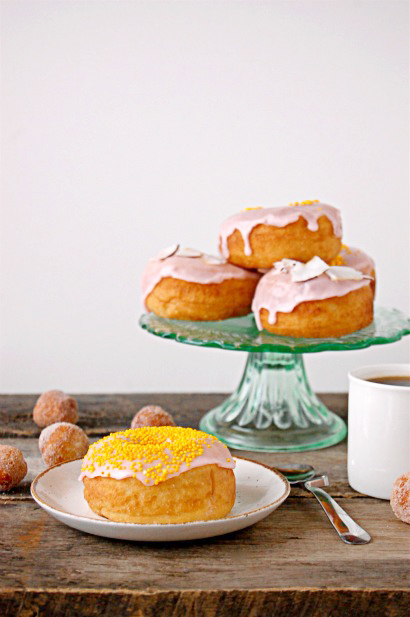 Gorgeous blog and I simply love these pink doughnuts! These doughnuts are the cutest I ever saw (and yummi). I will try to make them too. How many grams do your cup measures?